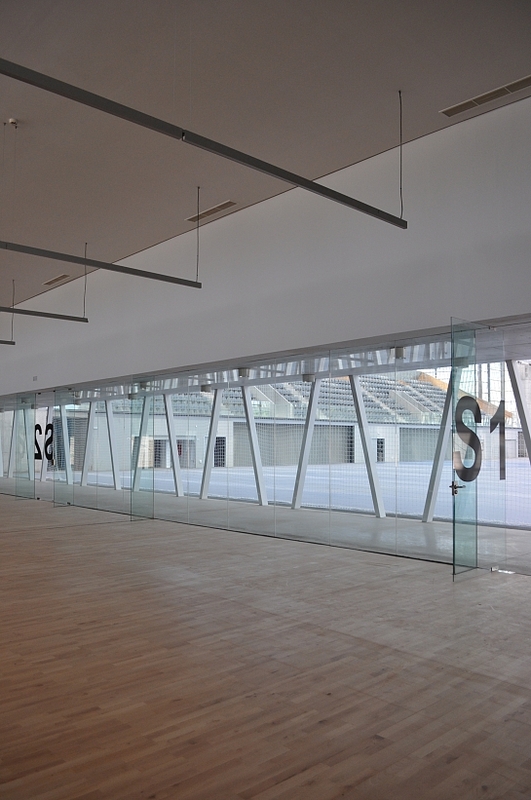 The new Sports Hall of Alcázar de San Juan has a large sports ground of 67 by 45 meters allocating three volley ball courts in parallel, two seating areas for the public on the long sides with a total capacity for 1.890 seats, a café on the Northern side and a bar of offices and maintenance facilities on the Southern side. Circulations are organized and differentiated in two levels: the lower one for the sportsmen, were the courts, lockers and fitness room are located, and the upper level for the general public. The access to both levels is direct from the outside on both sides through ramps, allowing for a potential public use of the lower level in case of civic events or popular sports events, like marathons, educational activities, etc. Moreover, due to its size and configuration and flexibility, the Hall allows for a large variety of other sporting, cultural, musical and entertainment events, attracting public and attendees at a regional scale. Conceived as a soft shape without edges, its curved perimeter aims to naturalize the relationship between the Sports Hall and its environment, avoiding the imposition of a hierarchy in the façades and promoting a sustainable architecture integrated on the surrounding urban landscape. The first action affects the land: the ground it is pierced, as in a foundational trace, from East to West, marking the location of the new architecture. The integration into the ground reduces the built volume as well as exposure to sunlight, promoting environmental balance. And above the ground, as if it were a fabric, space is contained and defined by a construction of textile character, able to define a limit while maintaining continuity with their immediate surroundings. 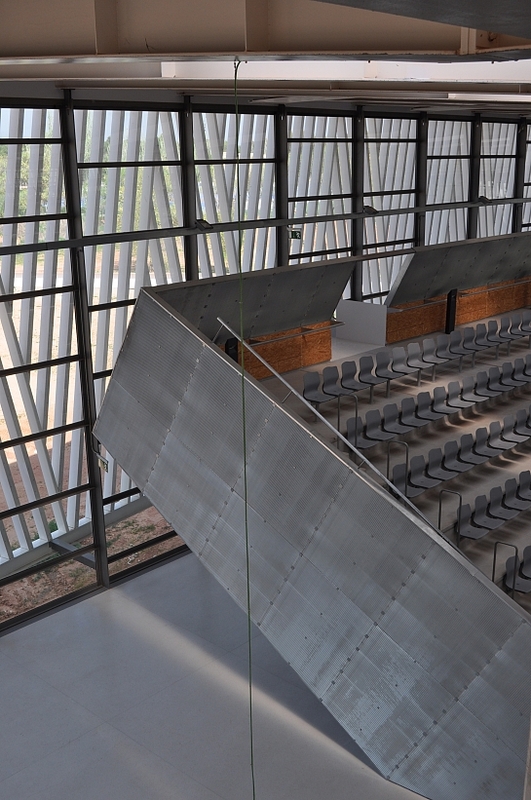 Four vertical concrete piers support the flat platform of the steel roof structure. A system of I beams alternate and construct a pattern of light and shadow that control and filter natural light all throughout, assuring its adequacy to the sports activity. Its prefabricated and repetitive nature is manipulated to promote the quality of a woven textile that extends to the building facade. The interior space is surrounded by two façade envelopes: an interior courting wall, light and transparent; an outer one, hanging from the edge of the roof and compensating its large span, promoting thinness and lightness, thus ameliorating the impact of unfavourable sunlight orientations and prevailing winds and reducing exposure of the building.